Shown with a toggle clasp and an add-on Star of David charm. 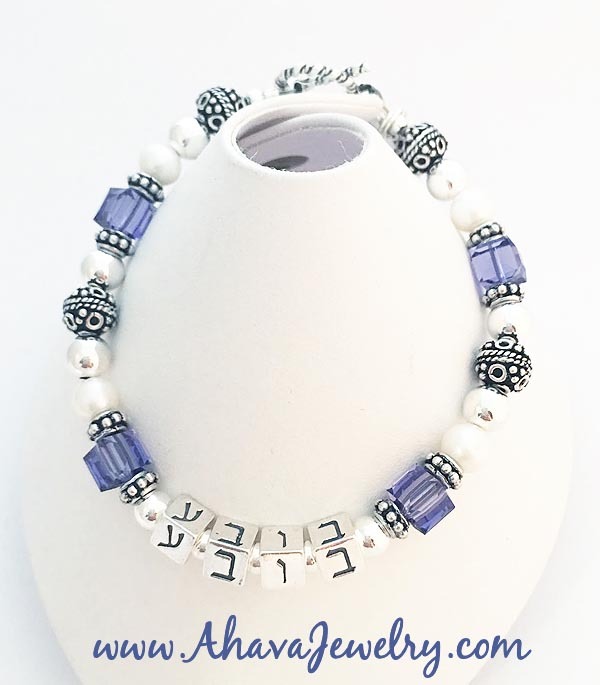 Bubbe is Yiddish for grandma and this sterling silver Bubbe Bracelet I used the Hebrew letters. Going from left to right it is Bet, Vuv, Bet, Ayin. This Bubbe Bracelet is shown with a sterling silver Chai charm, which is an add-on. She has 6 grandkids so I added 6 birthstones. I can do more or less birthstone for number of grandkids she has. The bracelet shown is a 7 1/2" and is considered "average" in size. You get to choose the colors of the crystals. Enter Name(s) and Birth Month(s) or Color(s): Please abbreviate because space is limited. This Bubbe Bracelet is shown with a lobster claw clasp with April (Diamond) and March (Aquarmarine) Birthstone Crystals by Swarovski. They added a Chai charm and earrings. 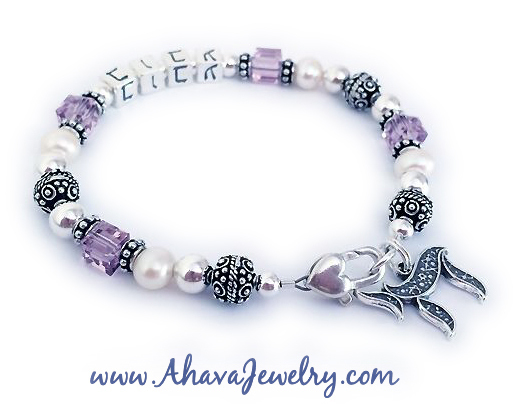 This Bubbe Bracelet is shown with a Twisted Toggle clasp and Purple Swarovski Crystals. This Bubbe Bracelet is shown with an upgraded Heart Lobster claw clasp, June Birthstone Swarovski beads and they added a Chai charm. This Bubbe Bracelet is shown with a lobster claw clasp, 4 birthstones for 4 grandkids and they added a Chai charm. Pick your favorite design and then call or email to order a 2 or more string bracelet. 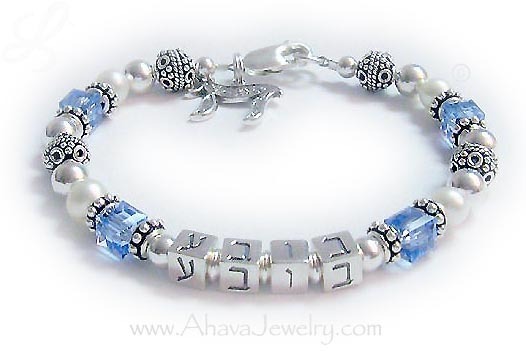 BUBBE Bracelet with Bet, Vuv, Bet, Ayin (Hebrew letters). It is shown with an ADD-ON Chai charm. They choose December Swarovski birthstone crystals and a sterling silver lobster claw clasp. This bracelet is all sterling silver and off-white fresh water pearls. 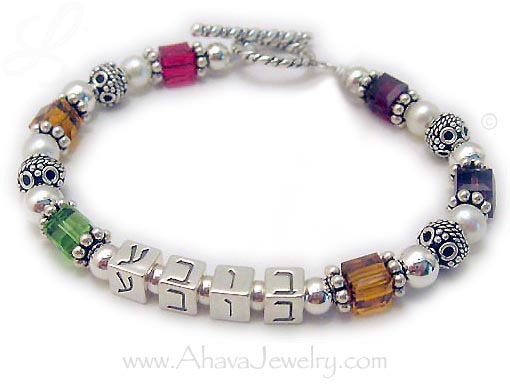 Bubbe Bracelet with October and February Birthstone Crystals shown with an optional Chai charm. This is a fully beaded BUBBY necklace with birthstone crystals. If offer 2 different options for coordinating necklaces. Option 2: 7" of beads (exactly like the bracelet) on an 18" chain.